While still in his thirties, a relatively young age for an established artist, Yves Telemak became a prominent member of the famous "Bel-Air school" of flag-makers. 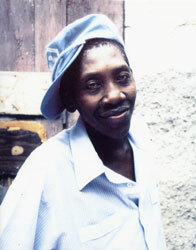 The son of a respected vodou priest, Yves began his career by working as an assistant in the atilye (atelier) of the Bel-Air flagmaker Joseph "Boss To" Fortine. After learning the craft from "Boss To", Yves ventured out on his own. 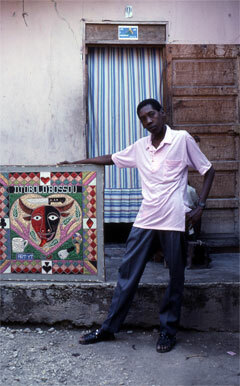 Eager to design drapo Vodou that expressed his personal artistic vision, Yves transformed a room in his family compound into a small workshop and began making flags. Like most premiere flagmakers, Yves makes drapo for Vodou societies, but the vast majority are sold to tourists and art collectors. The central motifs of his works are inspired by the religious traditions of his family, suggested by friends and acquaintances, or based on popular images culled from magazines and tourist brochures. Brilliantly expanding upon the distinctive styles employed by the Bel-air artists with whom he trained, Yves' complex geometric patterns and wide polychromatic borders make his work the most readily identifiable of any contemporary flagmaker.